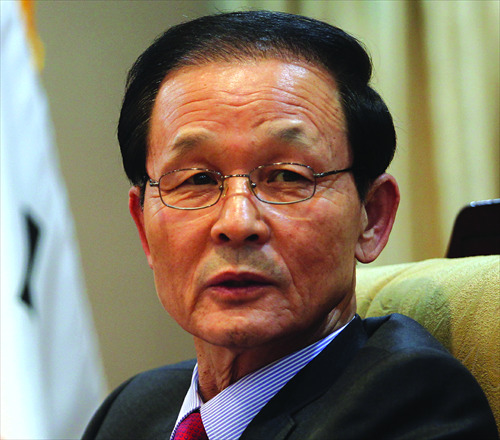 In March, Kim Jang-soo (Kim) arrived in Beijing as the new South Korean ambassador to China. This is also the first time that the position has been taken by a military official as Kim previously headed South Korea's Ministry of National Defense and National Security Office, and was also army chief of staff. What's his take on the South Korea-China relationship? What does he think of the situation in Northeast Asia? Global Times (GT) reporter Sun Xiaobo talked with Kim on these issues. GT: Many analysts say your appointment indicates notable progress in China-South Korea relations given your rich experience in national security and diplomacy. Where do you think the bilateral relationship stands now? Kim: The relationship between South Korea and China stands at its highest level since the two established diplomatic ties in 1992. Bilateral exchanges in a wide range of sectors such as frequent visits of top leaders and senior officials, economic cooperation, cultural and personnel exchanges have reached their peak. Particularly the initialization of the bilateral free trade agreement (FTA) and the personnel exchange of over 10 million people last year show the deepening of our strategic partnership. As South Korea's ambassador to China, I will endeavor to consolidate the foundation that the two presidents have laid for the bilateral relationship over the past two years. We'll strengthen our cultural exchanges and cooperation in the regional and international arena to enrich the strategic partnership. We hope to have more communication in strategic cooperation in a bid to solve the North Korean nuclear issue and facilitate the peaceful reunification of the Korean Peninsula. What we want is not paper talk but workable strategies. GT: You said upon your arrival in Beijing that there is potential in China-South Korea relations yet to be tapped. Can you elaborate on it? Kim: There is tremendous potential to tap in all-around cooperation, such as security and military, notably peaceful reunification of the peninsula and cyber security. Our cooperation will enormously improve after the bilateral FTA takes effect. As a founding member of the Asian Infrastructure Investment Bank (AIIB), South Korea can also expand infrastructure cooperation with China. Besides, the two sides can have more collaboration on environmental protection, climate change, health, energy, electronics, urbanization and government procurement. In cultural and personnel exchanges there is also much capacity to be developed such as academic exchange, tourism of historical sites, the airline business, catering, arts and music. GT: You mentioned the importance of bilateral exchanges in the military and security sectors. What phase do you think the two stand in this regard? Kim: There has been a direct telephone line set up to deal with contingencies and a hotline to be established between the two defense departments. Our military and security exchanges are not yet at their peak, but they are developing well generally. There are already channels for high-ranking military officers to have strategic dialogue in place. Representatives of the Six-Party Talks now also have smooth communication. GT: While South Korea joined the AIIB as one of the founding members, the US and its ally Japan still reject membership. Was it a hard decision for Seoul to make? Kim: China, the US and South Korea are aware that in fact the South Korea's alliance with the US doesn't contradict its relationship with China, and these are not zero-sum games. We are committed to coordinating the two relationships. In this sense, a good relationship between China and the US will facilitate our trilateral relations. South Korea made the decision to join the AIIB out of consideration for our national interest. We'll work with other members to make the AIIB an exemplary case of an international development bank. GT: As for the South Korea-US alliance, the recent visit to the US by Japanese Prime Minister Shinzo Abe seems to have put pressure on it. What do you think of it? Kim: Abe's visit to Washington hasn't put any pressure on our alliance with the US. We maintain the alliance in accordance with our own needs. When addressing the joint session of the US Congress, Abe said what the US had hoped to hear, I would rather say. GT: The Terminal High-Altitude Area Defense system (THAAD), which the US is reportedly considering deploying in South Korea, has triggered concern from China and Russia. As for your reply to a related question in a recent interview on v.ifeng.com, can I say that the South Korean defense system has no relation to the US defense deployment in Asia? Kim: South Korea's defense system targets the terminal phase of missiles, which is different from US missile defense system. The US missile defense system is designed as anti-ballistic missile system on the sea, land and air, including both the rising and descending phases. On THAAD deployment, the South Korean government's stance is unchanged. We have no knowledge of the US decision or demand, and Seoul and Washington have not negotiated on it. This was also confirmed by US Defense Secretary Ashton Carter during his visit to South Korea in April. The fundamental elements that make THAAD so widely worrisome rest on the nuclear issue of North Korea, which has caused regional instability that doesn't serve China's national security and strategic interests. It's hence essential for South Korea to have more communication with China. GT: Northeast Asia faces instability given the growing right-wing tendency of the Abe administration on historical issues such as "comfort women" and history textbooks. What's your take on this? Kim: South Korea, China and other neighboring countries were all victims of Japanese imperialism. While showing no sincere apology for Japan's wartime history, incumbent Japanese leaders instead attempt to cover up, distort and beautify Japan's wrongdoings in the past, showing a growing tendency of historic revisionism. This has raised concerns from South Korea, China and the international community. Japan needs to admit and repent on what it has done in wartime, and make an apology to the victims. South Korea is closely following the message that Abe will send in his statement on August 15. As this year marks the 50th anniversary of the diplomatic ties between South Korea and Japan, we hope the Japanese government can confront its history uprightly and rebuild trust with South Korea and other neighboring countries. I particularly hope that those people with vision in Japan can play an active role.